1. For applications such as gap transporting between conveyors, removing of pucks and similar items from containers, bottom coding, decorating, etc. 2. Completely portable on heavy duty casters. 3. Electronically controlled variable speed adjustment for carrier belts to accommodate a wide range of applications. 4. Available with or without conveyor. 5. Carrier belts available in several lengths. 6. Upper structure with standard stainless steel shafting, guarding, gripper drives, etc. 7. Completely adjustable - no changeover parts required. 8. Double set of bottle gripper belts available. 9. Handles vials up to 2-1/2 gallons plastic, glass, or metal containers of all shapes and styles. 10. 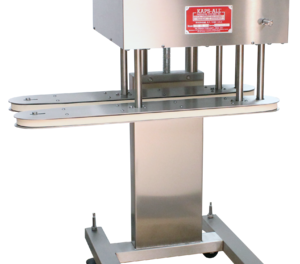 Bottle gripper belts are adjustable up or down to accommodate most bottle sizes and shapes. 11. Two-year guarantee (not including belts). 12. 1” high bottle gripper belts. 13. Gripper belts with your choice of 16” or 23” carrying distance. 14. Left to right conveyor travel is standard. Right to left is available as an option.